The Williamsburg Animal Clinic is located at 14 Goshen Road (Rt 9) in Williamsburg, Massachusetts. We are approximately 10 miles (15 minutes) from the center of Northampton. From Northampton: Take Route 9 West thru Florence Center, Haydenville, and Williamsburg Center. We are located on Route 9, 7/10ths of a mile West of the Williamsburg General Store. Our Clinic is on the right. From Cummington: Take Route 9 East thru Goshen, passing Pat’s and Bacon’s on the right. We are located on Route 9, approximately 1/2 miles East of Bacons. Our clinic is on the left. Our veterinarians and staff are well trained to evaluate and treat most medical or traumatic emergencies. During office hours, we will see sick or injured animals ASAP. 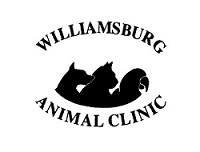 After hours and on weekends there are several 24-hour veterinary emergency clinics that are always open when the Williamsburg Animal Clinic is closed. If indicated, we may also recommend transferring your pet to one of these facilities for timely diagnostics, surgery, or intensive care. We accept cash, personal checks, VISA, MasterCard and CareCredit. A deposit may be required in an emergency or prior to non-routine surgical procedures. Unless arrangements are made in advance, payment is due in full when services are rendered. We offer senior citizen discounts as well as NSPCA Spay and Neuter coupons. We offer CareCredit to our clients Care Credit is similar to other major credit cards but with two unique features. Every CareCredit transaction is eligible for a No Interest or Low Interest Payment Plan. Whether it's routine checkup or emergency care, you shouldn't have to worry about paying for the best medical care for the pet you love. CareCredit lets you immediately say "yes" to the treatment your pet deserves and pay for it over time with low monthly payments that fit easily into your budget. For more information about CareCredit, contact our office or visit the CareCredit site below.